While Apple executives seemed careful to reveal very little during the company's fiscal Q2 earnings conference call, a new hint at Verizon iPhone sales slipped in the revelation of 150 percent quarterly growth in US iPhone sales over last year. AT&T just revealed that its iPhone activations were up 33% in the first calendar quarter of 2011, amounting to 3.6 million new iPhones on its network compared to 2.7 million in sales for the same quarter in 2010. During Apple's own conference call however, chief operations officer Tim Cook noted that iPhone sales "did well everywhere," but drew special attention to dramatic growth in China (where he said iPhone sales were up 250 percent) and in the US (where he noted iPhone sales grew by 150 percent). Cook said that adding Verizon as a new carrier during the quarter was "key" in that strong US iPhone growth, while also noting that AT&T also "did extremely well." Using AT&T's activation numbers from the year ago quarter, growth of 150 percent would indicate that American sales reached 6.75 million iPhones. Subtracting the 3.6 million units AT&T activated this quarter indicates that an additional 3.45 million iPhones are either in US inventory awaiting activation, or were sold by Verizon. Apple indicated that its global channel grew by 1.7 million iPhones to support support new carriers, including Verizon and other major carriers internationally such as SK Telecom in South Korea and Saudi Telecom in Saudi Arabia. Verizon hasn't yet reported how many iPhones it sold in the last quarter (it is expected to do so tomorrow), but based on AT&T's activation numbers and growth figures, it appears Verizon sold in the ballpark of 3 million units since it began offering the iPhone to its own subscribers on February 3, and to the general public a week later. Sales of about 3 million Verizon iPhones would be inline with analysts' expectations from January that predicted the new carrier would help Apple sell the iPhone to between 9 and 12 million new users. Growth in iPhone sales through Verizon was also credited for enabling Apple to outpace Android in ad impressions observed by Millennial Media in March. The firm said Verizon iPhones accounted for 8.2 percent of iPhone ad impressions last month. Chitika's mobile ad network reports a 13.6 percent share of iPhone impressions from Verizon's network. Analyst Ming-Chi Kuo of Concord Securities told AppleInsider in February that discussions with component makers in Apple's supply chain indicated that Apple had prepared 2 million CDMA iPhones in advance to meet demand. The day Verizon began offering iPhone 4 to its existing customers, company president and chief executive Dan Mead announced, "this was an exciting day. In just our first two hours, we had already sold more phones than any first day launch in our history." The company didn't begin selling the iPhone to the general public until a week later, and online sales through Apple were delayed even further. 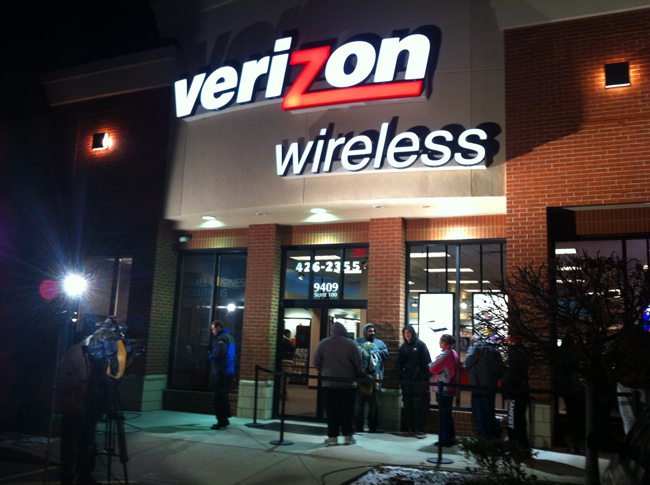 A line of about 20 customers stands outsize Louisville, Ken., Verizon store Thursday morning. Photo via Flickr user jasonhiner. Despite record sales, the staggered launch of iPhone 4 on Verizon's network failed to generate long lines of buyers, resulting in reports that the launch was "not blowout" and leaving some bloggers, such as Dan Frommer of Silicon Alley Insider to coyly remark that lines were "laughably short."